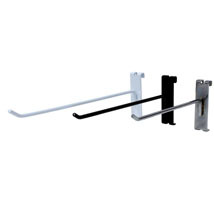 Display a wide variety of products on these high-quality peg hooks! These black peg hooks for 3 in. grid are available in 2, 4, 6, 8, 10 and 12 inch lengths. These peg kooks will work on the 3 in. on center grid panel. For further options, we encourage you to take the occasion to look at our thorough collection of peg hooks for grid at Specialty Store Services now.